Drop Tower is an excellent drop ride in Medieval Faire and one of the best attractions at Canada's Wonderland. The minimum height to ride is 54 inches. 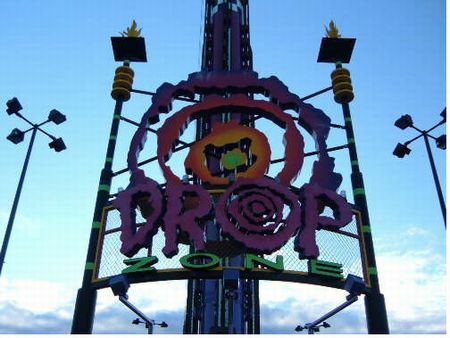 Formerly named "Drop Zone", this free fall attraction has sisters found at Carowinds and Great America. Twenty passengers are gathered into groups of four to board one of the five gondolas. Once strapped in, the gondolas slowly ascend the base of the tower. All of a sudden a transition in speed takes place as the gondola quickly picks up the pace to reach the 230ft pinnacle. Once at the top, a person will not have too much time to get used to the view as the pulley disengages and the gondolas free-fall back to earth providing four seconds of pure air time, one for each checkerboard pattern on the tower.